It’s Wrestlemania weekend! Listen to episode 123 of the Wrestling House Show as we discuss, preview, and predict every match on Wrestlemania and NXT Takeover New York! Also, we get excited about the NJPW and ROH G1 Supercard, and we get serious as we discuss John Oliver’s recent comments on WWE and their checkered history with the health of their workers. 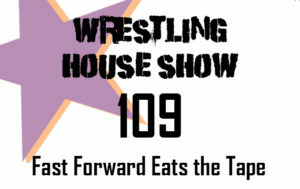 In the weeks building up to the most unnecessary of shows, Fastlane, we saw some oddly-timed callups from NXT, some clear favoritism in the women’s divisions, R-Truth’s open challenges, and a lot of good wrestling! Listen to episode 122 of the Wrestling House Show to hear all about it plus much, much more! Listen to episode 121 of the Wrestling House Show as we talk about the weeks leading up to and including WWE Elimination Chamber! We cover Becky Lynch and her questionable choices, the worst RAW commentary in a very long time, air guitar culture, Dean Ambrose and his contract, and the rise of Kofi Kingston! All this plus continued excitement for AEW and much more! 2019 has just started, and we’ve already seen a whole bunch of great wrestling! Listen to episode 120 of the Wrestling House Show as we recap the month of January and talk about Wrestle Kingdom 13, NXT UK Takeover: Blackpool, NXT Takeover: Phoenix, the Royal Rumble, and the first four weeks of WWE TV! Wrestling House Show presents the second annual WHS Year-End Awards! The best matches, the best people, and the best of some of the worst! It’s the best! RAW reached a breaking point heading into December 2018, but did WWE give us the worst RAW ever during that time? And what of the “fresh start?” Should we buy into it? Will it be a long-term solution or just a short-term fix? Also, how can the view of cruiserweights be so different between RAW and SmackDown? And can NXT and NXT UK be a place for journeymen (and women)? All this plus Dijak’s ridiculous new name, the (sort of) return of Spanky, Mustafa Ali making waves, a discussion of TLC, and our favorite matches for the month of December, all on episode 118 of the Wrestling House Show! Take a gamble on episode 117 of the Wrestling House Show in which we discuss betting on wrestling, AJ Styles’ crotch, The Man, rewarding people who concuss people, the greatness of NXT WarGames, the not-so-greatness of Survivor Series, Baron Corbin math, turkey punches, bad times in Liverpool, and the alternate reality of the Mixed Match Challenge! All this plus the best WWE/NXT/NXT UK matches for every week in November! Thank you for your time. 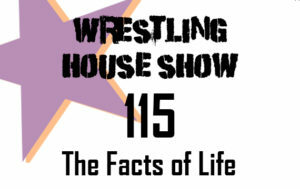 Listen to episode 116 of the Wrestling House Show as we talk about the unfortunate departure of Roman Reigns as well as everything else worth talking about in the WWE in the month of October! On an extra-special episode of the Wrestling House Show, we take an in-depth look at this year’s Mae Young Classic as well as WWE Evolution! We take a few soapbox moments in our September wrap-up show as we build your ultimate WWE-centric supercard from the hours and hours of WWE television! We also go off on tangents about topics such as our thoughts on All In, the new guy in Dragon Gate, the Dragon Gate guy in New Japan, the pitfalls of wrestlers on social media, WWE tying up multiple titles in a single feud, Brie Bella and her kicks, Becky versus Charlotte, the break-up of Rusev Day, and much, much more! August had us thinking about whether or not Ronda Rousey is truly part of the RAW women’s division, the greatness of NXT Takeover: Brooklyn 4, the rise of Andrade Almas on the main roster, RAW fumbling with their tag teams, the reign of Roman Reigns, the best bout machine of 205 Live, a debate over the best match at Summer Slam, a complete agreement on the worst match at Summer Slam, and a as much more wrestling talk as we can fit into about two hours! Dial up the latest episode of the Wrestling House Show for all this plus a preview of our All In review! July was a strong month for the WWE Universe in a lot of ways, though there was plenty that could have been better. Listen to episode 112 of the Wrestling House Show as we share some gripes, observations, and yuk yuks including more on the Sasha/Bayley missed opportunity, Chris Dijak’s NXT debut, obnoxious fans, Titus Worldwide’s Hulu absence, how this year’s Money in the Bank contract should be handled, size shaming, bingo halls, and as always, the best matches from every week in July! Over the span of a few weeks in the summer of 2018, the world lost some legendary pro wrestlers. 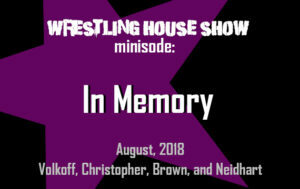 To pay tribute to those men, we decided to make a special mini episode of the Wrestling House Show to share some of our memories of Nikolai Volkoff, Brian Christopher, Brickhouse Brown, and Jim “The Anvil” Neidhart. The month of June brought wrestling fans a great NXT Takeover, an uneven Money in the Bank, a fantastic NJPW Dominion, and a whole bunch of WWE television of varying quality. 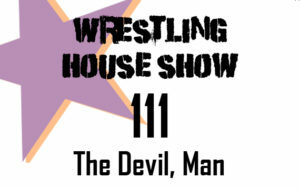 Listen to episode 111 of the Wrestling House Show as we talk all about it, including the best matches, the strangest story lines, and even the Devil himself! 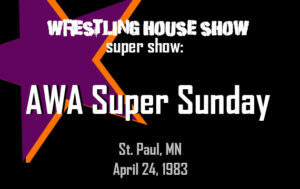 AWA’s Super Sunday in 1983 featured legendary wrestlers including Jesse Ventura, Nick Bockwinkel, Jerry Lawler, Mad Dog Vachon, and Verne Gagne, but is it worth spending the time watching the whole show today? Listen and we discuss the good and the not so good and let you know what to watch in the latest installment of the Wrestling House Show’s series of retro reviews! May was the month in which we got the first co-branded WWE PPV in weeks, saw both Ronda Rousey and Nia Jax become hypocrites, witnessed the continued excellence of Ruby Riott and Buddy Murphy, lamented the state of the RAW tag division, and much more! Join us for the May 2018 wrap-up episode and hear us explain everything we liked and didn’t like about a whole bunch of hours of WWE television! April was a time of change in the WWE. Wrestlemania, the nights after Wrestlemania, the Superstar Shakeup, and the Greatest Royal Rumble kept us busy, but was it all good? Was any of it good? Find out what we think in episode 109 of the Wrestling House Show, the April wrap-up episode! Wrestlemania has become about so much more than just one show, and if you travel to see Wrestlemania live, you can spend an entire week immersing yourself in pro wrestling from around the world. We did that this year, and this episode is all about our experiences during our week in New Orleans! Listen as we talk about the many, many shows we saw, the wrestlers we got to meet, the disappointments we faced, and our favorite moments from our pro wrestling vacation! March feels like it happened so long ago, but you can relive the relative excitement of the buildup to Wrestlemania by listening to episode 107 of the Wrestling House Show. Find out what we thought about this year’s pre-Mania mania, what matches managed to catch our attention, and what we found most (and least) entertaining in the month of March! February came and went quickly, so how was the wrestling? Listen as Joey and chris discuss their favorite matches from each week in February of 2018 as well as their thoughts about the buildup to Wrestlemania. All this plus much more on the second of the Wrestling House Show’s monthly wrap-ups!